« Ujee: from Alley Trash to Hawaiian Class! This missive is from Robert Roach. And please blame my rambling on Dale Wilson. Within days of our tragic loss last week, he forwarded the attached photo & asked if I’d be willing to write something about the photo’s background narrative. Even though doing so is bittersweet, it’s my honor. And I hope I do well by the story. For those who know nothing about me, I’m an artist in the entertainment industry & part of the consortium comprising The Antidote Trust–& its offshoot, BuyIndieComics.com. First, thank you for clicking onto this note. I intend for it to be both introspective & inclusive, so I appreciate your indulgence. I’ll be as brief as I possibly can. But when recalling two tremendous creative losses to us comics enthusiasts – Tony DeZuniga recently (the ARTIST in the photo) &, a year ago, Dwayne McDuffie – brevity is a challenge. Both men are foundational pillars upon which anybody that creates is standing. Both men were fun, self-depricating, full of insight & wisdom, generous with their time & knowledge – I could go on in this vein for a long time but I’ll stop now. Both men were wonderful to us Antidote Trust members. And both were excellent friends to me. During this era, when superlatives are too easily thrown around, both of these men were geniuses. GENIUSES. If you don’t know them, please search out their creative backgrounds & see all the places, stories & characters bearing their fingerprints. Their loss is enormous. But I’ll return my comments to the attached photo & through it refer to how good these guys were (& continue to be). That way they’ll become your friends too. Both came from divergent beginnings–Tony an immigrant from the Philippines in the 70s, Dwayne an immigrant from Detroit in the 80s. Their careers led them through NYC & ultimately Los Angeles (or Orange County, CA – Tony bounced around there too). And – finally – their divergent paths led them to the moment in this photo. In 2007, The Antidote Trust (TAT) got a corner booth at San Diego Comic-Con. It was great for us, but this opportunity came with a built-in challenge: no one knew what TAT was. (Many folks still don’t.) Who would visit the booth? Why would anyone visit the booth? Serious considerations. Both Dwayne & Tony were there on Friday & Saturday. Dwayne was making his Milestone/DC announcement that afternoon, so his signing slot was earlier than Tony’s. On Saturday, Tony signed before Dwayne – Tony at 2P, Dwayne at 3P. Now we’re up to the photo, the illustration & its significance. You see, like a lot of artists, Tony wasn’t big on hollering at passers – by, mugging for the press & so on. He’d prefer that his artwork did his speaking for him. So he sat at the booth’s signing table & drew on that oversized tablet with a fat marker. On one day he drew Jonah Hex & on the other he drew this picture of Conan. It was PHENOMENAL. It was like he was unconscious – except that he steadily conversed & drew. Like his hand was on auto-drive. Dwayne came by for his signing time slot while Tony was drawing – & immediately turned into “12 year old comic book geek boy”. “Oh my God! Look at what he’s doing! Is that Tony DeZuniga? !” He giggled. And anyone who knows Dwayne knows that this type of reaction was reserved exclusively for those rare, “I’m noting something exceptional” moments. I confirmed what Dwayne already knew & asked if they’d ever met. Dwayne said no & I made the introductions. So there were these two giants in the industry, meeting for the first time at our booth. And “giant” is a good description for one of these two. Dwayne was a solid man & about 6’7″ or 8″, while Tony was quite slim & only about 5’8″ or so. All of us knowing Tony’s work from the 70s-90s (“Savage Sword of Conan”, westerns, Phantom Stranger, Jonah Hex, Thor, etc. ), we all got sloppy nostalgic. During the conversation, Dwayne’s past editorial & writing work at Marvel, his co-founding of Milestone Media & animation work came out. Then it was Tony’s turn to get sloppy, recalling that though they’d never met, their working paths had overlapped many times. He then started mentioning notable storytelling elements & editorial decisions (especially, Marvel-related, Milestone-related & about the animation industry) that he thought Dwayne had probably influenced. And he was on point in about 90% of his observations. When I got back to the booth, Dwayne was continuing to hold court. Between photos with fans, creators picking his brain & signing comics/DVDs, he gushed about how cool it was to watch Tony DeZuniga draw. I was thinking the same thing – & how cool it was that Dwayne took out time to sign at our booth, for free. (He & I had a standing commitment that as long as I had a booth at SDCC, he’d sign at it. And he kept his word faithfully.) We had to pay him back somehow. So Dale, Richard Hamilton, Andre Owens & I had a brief discussion & came to a decision. As Dwayne was preparing to go to another signing or meeting or such, we showed him Tony’s Jonah Hex & Conan illustrations & told him, “Pick one.” After a moment of shock, the comic geek came out again. It took him two minutes, vacillating between the drawings. 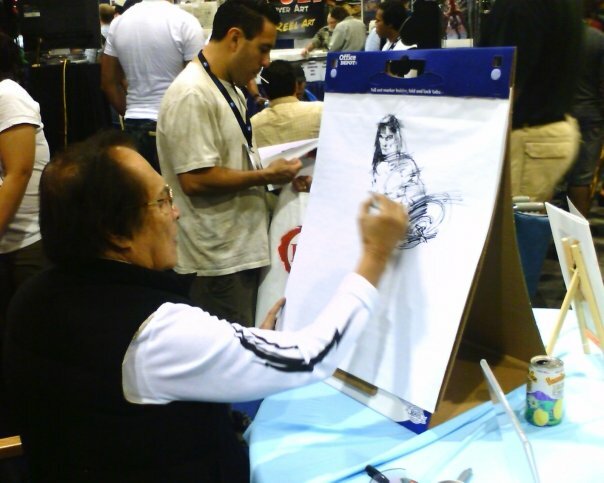 Then, based on his affection for Tony & John Buscema’s Conan, he took the illustration in the photo–grinning ear-to-ear. When we last spoke face-to-face, Dwayne told me that his Conan was still in his office. I don’t think it’s an outrageous guess to say that Charlotte (Dwayne’s wife) has this prized keepsake in a safe place. Other than the warmth of their friendship, the only other thing I could want from these gentlemen was their respect. And both showed this by wanting to work with me – Dwayne on a private project of his & Tony of some Jonah Hex assistance. Though we couldn’t bring these opportunities to fruition, such recognition enables us hardworking illustrators to create & persevere. The industry has lost a number of luminaries in the past few years. Gene Colan, Al Williamson, Moëbius, Harvey Pekar. Adrienne Roy. Many more than this smattering I’ve mentioned. All have left both a legacy & a void. As others join this list, I hope those who know them best will share remembrances of these creative greats with us. I want to know these inspirational people better. I also wanted to share with all of you how magnificent the two men that overlap in the attached photo were. And how magnificent they continue to be. This entry was posted in Columns and tagged dwayne mcduffie, menthu, robert roach, The antidote trust, the roach, Tony DeZuniga. Bookmark the permalink. Follow any comments here with the RSS feed for this post. Post a comment or leave a trackback: Trackback URL.